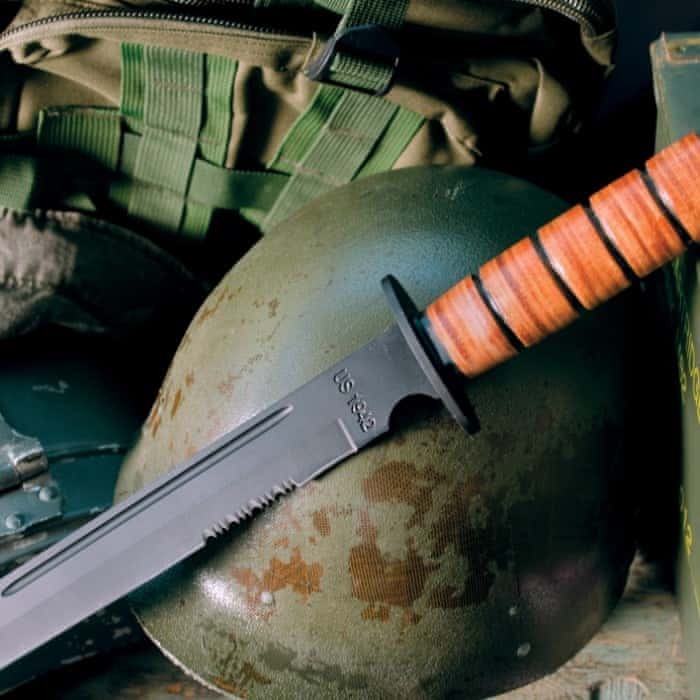 This 1942 military combat sword would do any serviceman proud with its razor-sharp black-coated AUS-6 stainless steel blade, featuring a blood groove, tanto point and partially serrated edge. 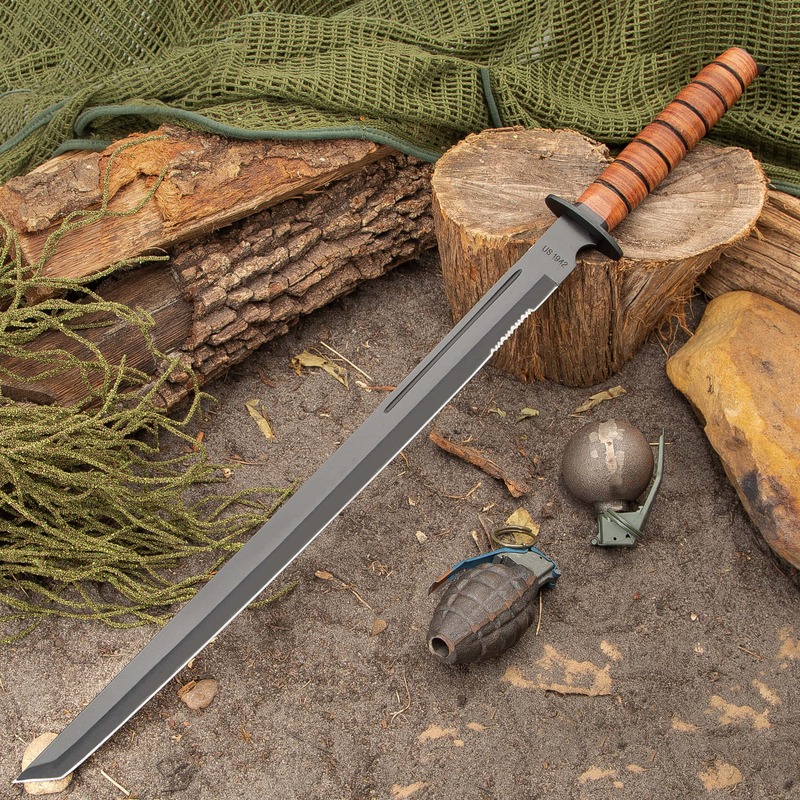 Like traditional fixed-blade military knives, this combat sword has a heavy stacked leather handle with a steel guard and end cap. 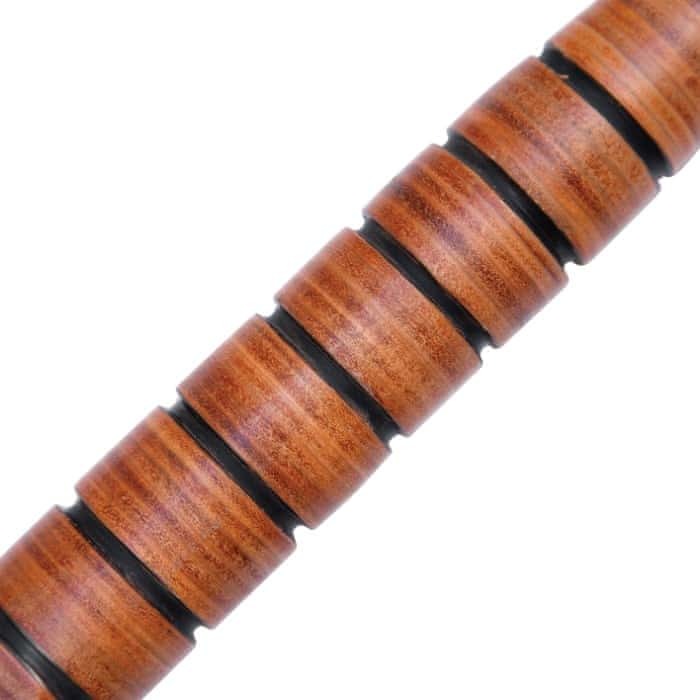 The blade measures 19-3/4" in length. 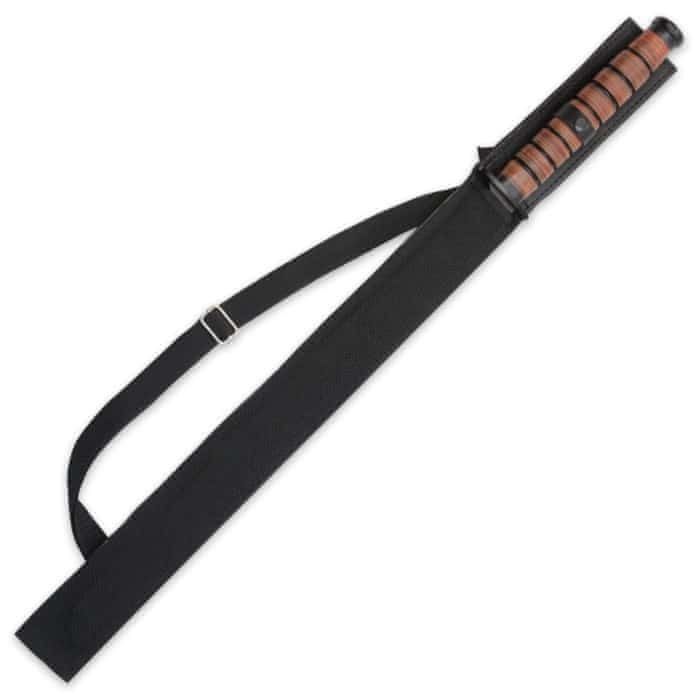 This 27-1/2" combat military sword includes a black nylon shoulder sheath sling that you can carry on your shoulder like a real combat soldier. solid feel, no rattles, out of box edge leaves much to be desired, and as with all stainless, if its not sharp to start with, its hard to put a good edge on it as opposed to carbon steel which is easy. Rather ironic that such a nice Marine version of a Kiridashi should exist. I am very pleased with mine. The scabbard, not so much. Surprising sword here! I bought it just for a display piece in my shop, but I'm impressed with the fine finish and quality appearance. Great price, too! I had it engraved and that came out perfect! Thanks! This is one of the best swords I've ever seen for under $30. It's razor sharp out of the box. 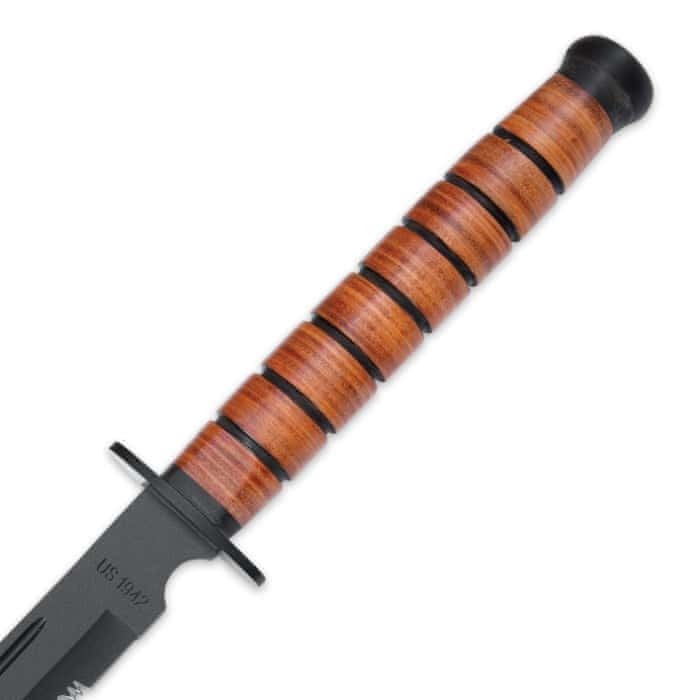 (I just cut myself on the serrated teeth today) It can take more abuse than some other swords I've seen, though I still only recommend it for light brush work and self defense. Only complaint is the length. 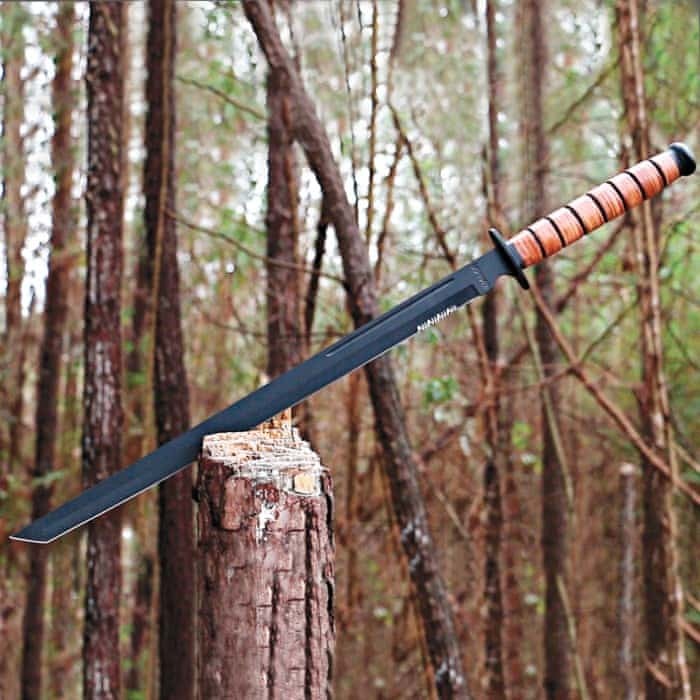 The picture looks like it's as long as a standard katana, but it's actually a lot shorter than I expected. Still for $30 you can't go wrong. I got 2 of these as an early birthday present for my husband, and he loves them. delivered super quick, and they are really neat. he hasn't tried really using them as of yet, but I feel like they will hold up nicely. THANKS BUDK!